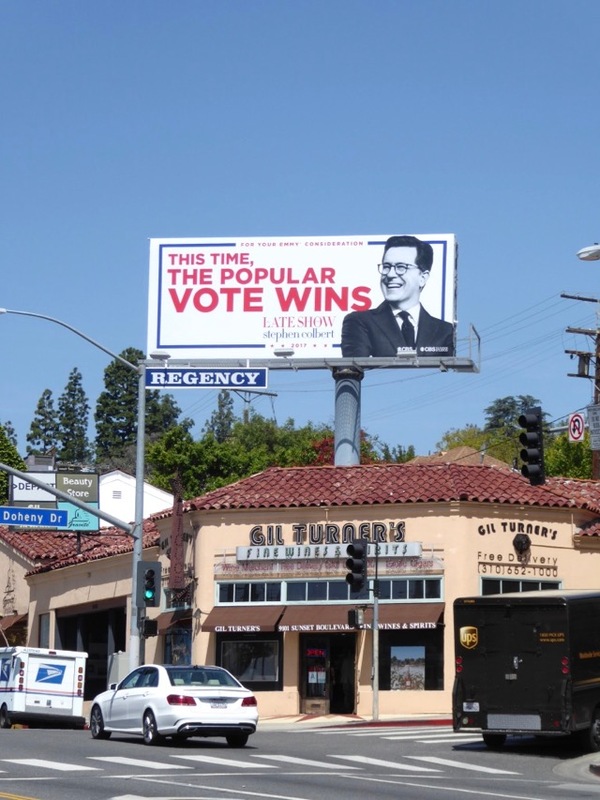 Stephen Colbert makes his move from The Colbert Report to helm The Late Show on CBS this Fall and has a bevy of billboards all over L.A. to make sure you get the message. For 1,447 episodes he played a fictionalised version of himself, parodying other anchormen and ill-informed late-night talk show hosts on Comedy Central's satirical news and chat show. 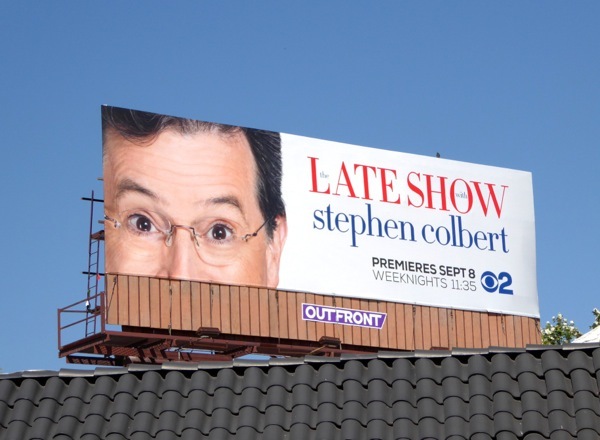 Now he has mighty shoes to fill as David Letterman retires from the time slot after hosting since 1993 and this time he'll be coming out from behind the caricature to host as himself. 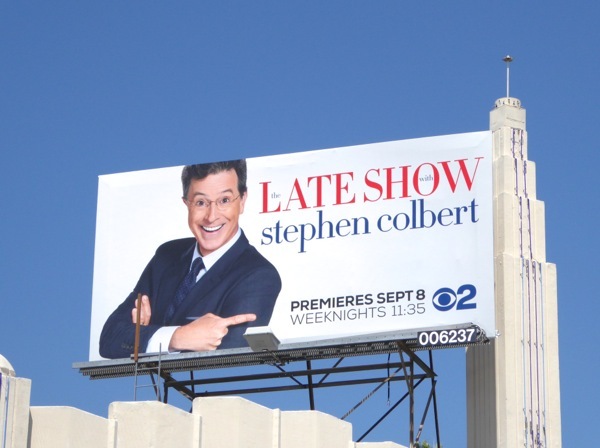 He's lined up an impressive array of guests for his first few shows, with George Clooney being his first official guest. 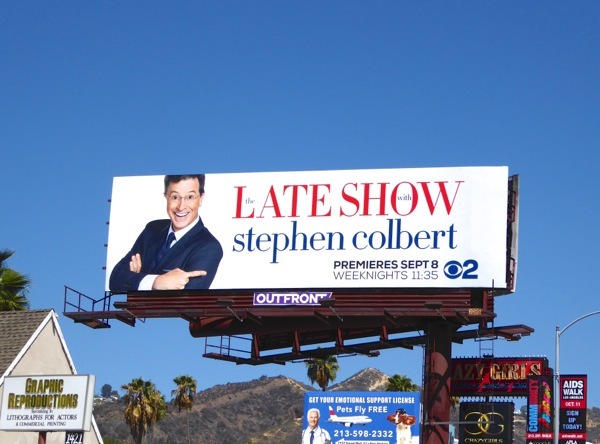 In addition to the usual Hollywood celebs with new movies, TV shows, songs and books to promote, he'll also have more than his share of political guests, so you can look forward to a mix of Scarlett Johansson, Lupita Nyong'o, Amy Schumer, Emily Blunt, Jake Gyllenhaal, Stephen King, Senator Jeb Bush and Senator Bernie Sanders, to name but a few. 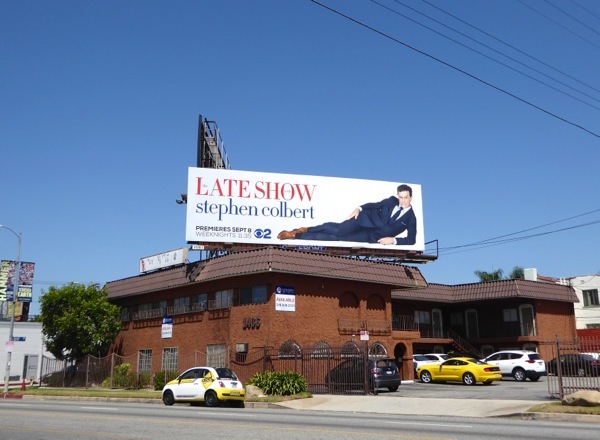 These irreverent billboards heralding his Late Show debut were first snapped along Pico Boulevard on August 12, then along Santa Monica Boulevard, La Cienega Boulevard, Fairfax Avenue, Beverly Boulevard and La Brea Avenue through September 7, 2015. 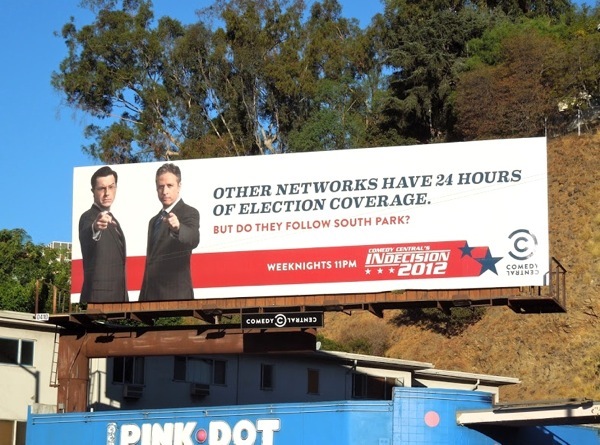 Here's also a bonus billboard blast from the past, when Stephen Colbert and Jon Stewart were providing Presidential Election commentary on Comedy Central, snapped along the Sunset Strip in October 2012. 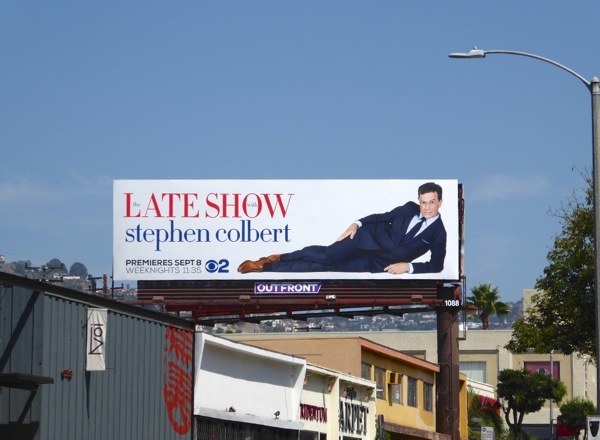 As you can see from all these ads he can pose like a model, raise his eyebrows and point his finger with the best of them, so what more do you need to be able to do to be a late-night talk show host? 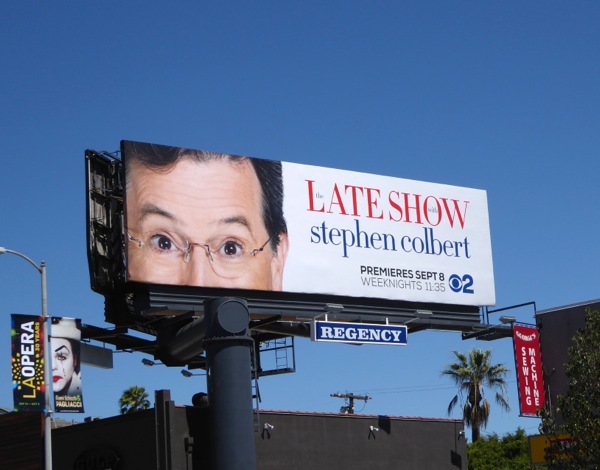 Good luck Stephen, and after the rest of you have checked out his debut hosting gig tonight, be sure to come back all this week for more fun new TV show billboards filling the L.A. skyline. 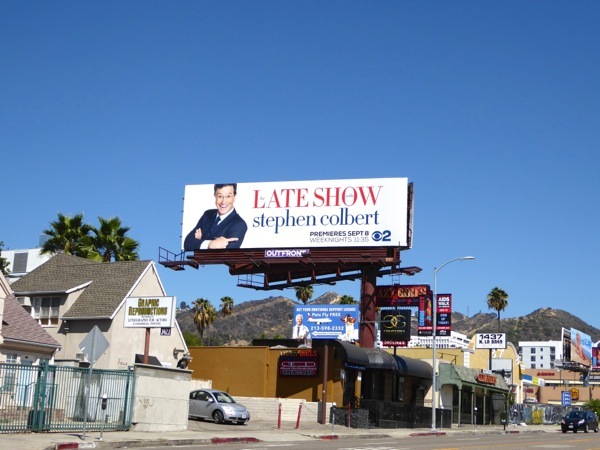 UPDATED: Here's also a creative Daily Billboard didn't spy in L.A., but spotted in New York City on November 3, 2015. 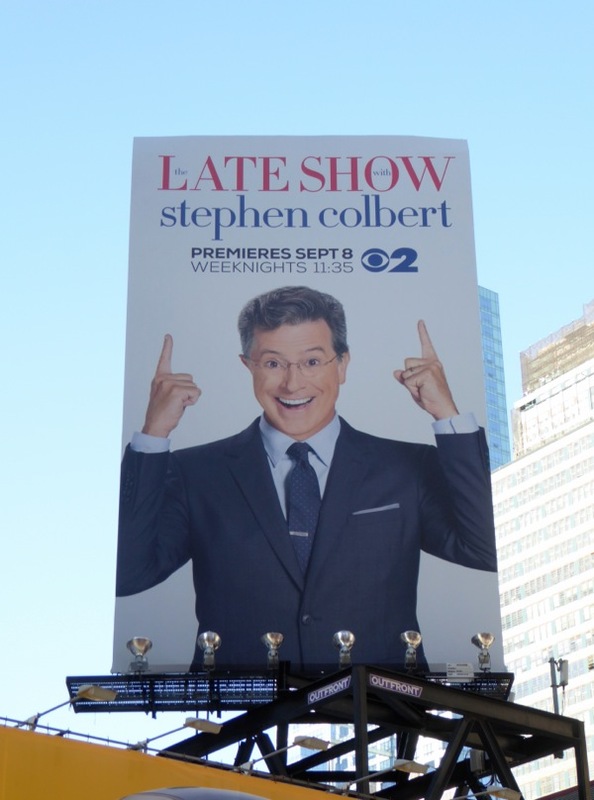 Stephen Colbert certainly seems to be a fan of the pointing finger. 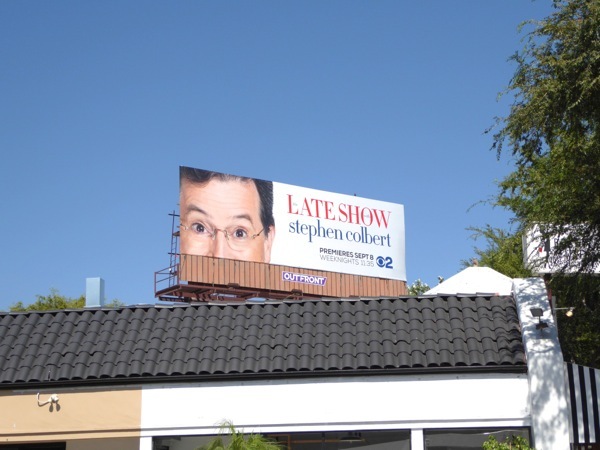 UPDATED: In addition here's a recycled ad creative to help elicit 2016 Emmy consideration for The Late Show, snapped along Santa Monica Boulevard in West Hollywood on May 10, 2016. 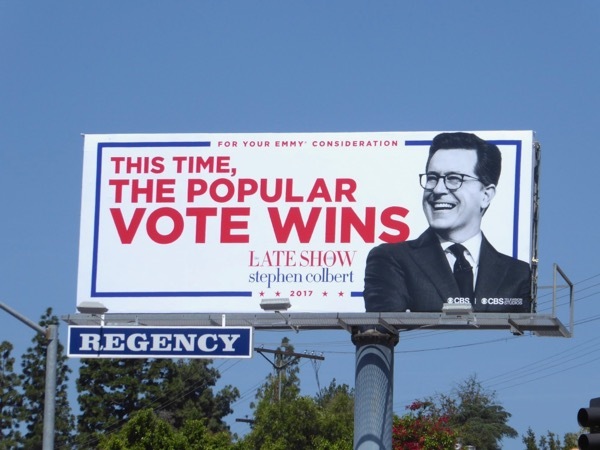 UPDATED: Stephen Colbert's Late Show may have struggled with ratings initially, but his viewership has grown as his satirical criticism of the new Trump administration has made him must-watch TV. 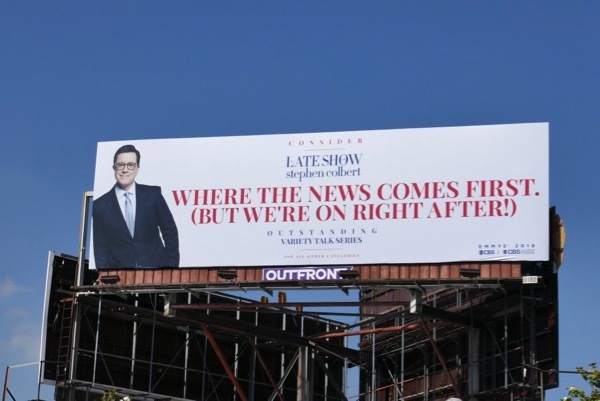 Here's a very timely and funny post-Presidential election Emmy consideration billboard snapped along West Hollywood's Sunset Strip on May 8, 2017, just as the late-night host is pettily investigated by the FCC after one of his recent anti-Trump tirades following the President calling CBS journalist John Dickerson fake news to his face during an interview. 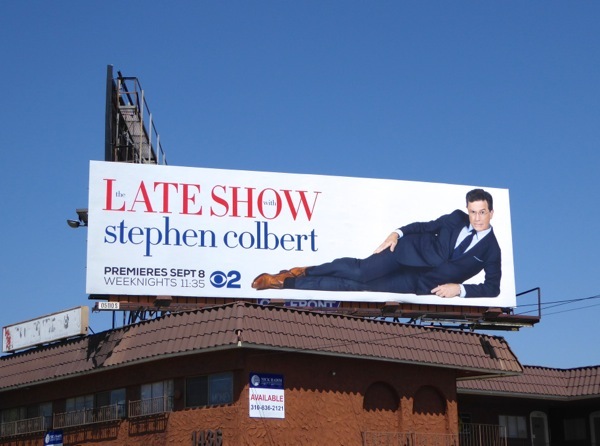 You've got our vote Stephen. 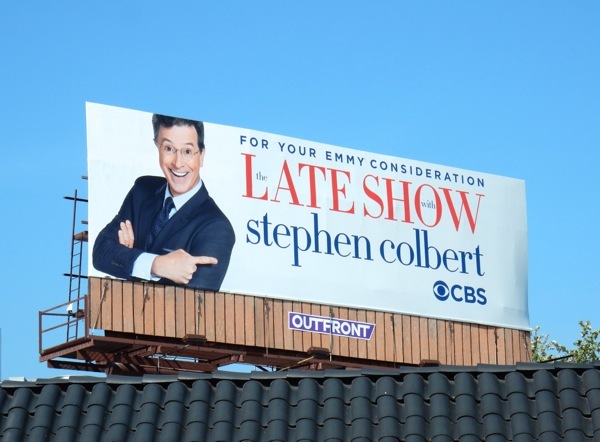 UPDATED: Here's another witty subsequent year Emmy consideration billboard for The Late Show spotted along the Sunset Strip on June 1, 2018.